TYCO’s G.I. Joe Electric Train & Battle Set (No. 7418) made its debut in the company’s 1983 product catalog and received exposure on the cover of that year’s publication. This is an important set for TYCO historians, as it marked the first of the electric train manufacturer’s line of licensed characters from television shows and movies for the 1980s. The last time TYCO offered such licensed sets was back in the mid-1960s. It is also a somewhat sad point in TYCO history for those with a passion for the company’s model railroad line, as this set was the first of a number of non-railroad name decorated offerings that marked the beginning of the slow retreat from HO-scale electric trains for the long-time hobby company. A decade after TYCO introduced its G.I. Joe set, you would see the last appearance for HO trains in the company’s 1993 product catalog. Take a close look at the small industrial diesel switcher that appears on the cover of TYCO’s 1983 catalog. It is not the same Plymouth MDT diesel switcher model that joined TYCO’s line around 1970. From examining sets, you’ll find this diesel switcher variant appeared in some G.I. Joe sets. Other sets appear to include TYCO’s traditional Plymouth MDT diesel switcher. 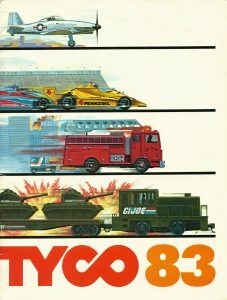 Adding to the confusion, TYCO’s two-page illustration appearing on pages 14-15 of the 1983 catalog show what looks like the regular Plymouth MDT, as opposed to the catalog cover’s larger cab with side handrails version. TYCO’s Plymouth MDT diesel switcher was a product of Hong Kong, while the variant switcher found in some G.I. Joe sets is from Mehano of Yugoslavia. 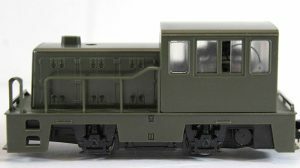 You’ll find origin markings on the bottom of the variant switcher that will include “RSO.” Below is an image of TYCO’s Yugoslavian-made diesel switcher that appeared in some G.I. Joe sets. This switcher never saw a known separate sale release in TYCO’s line and is only known to be available in molded green plastic from the company. 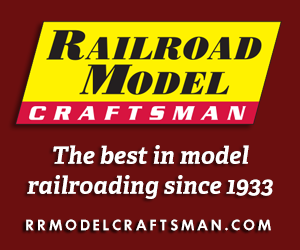 You will find this switcher available from other hobby companies in North America over the years, including AHM in the 1970s and Bachmann in the late 1980s. The model generally reproduces General Electric’s 35-ton prototype. The set provided a 50-foot flatcar, 40-foot single-done tank car, 40-foot gondola, and the company’s signature streamline-cupola caboose. When looking for examples of this set, untouched models will be plain green, except for the 40-foot gondola. That model appears with white “SPECIAL FORCES” pad-printed lettering. Rolling stock is standard TYCO tooling and you’ll find the company’s name and Hong Kong origin markings on the underframes of the models. Decoration for the train models, as well as provided tanks, jeeps, helicopter, and boat came from a sheet of G.I. Joe stickers TYCO included with this set. Given its three-year run in TYCO catalogs and likely large production run, it is a bit surprising that models did not receive G.I. Joe markings from the factory. TYCO provided plastic soldiers, four tanks, two jeeps, a helicopter, assault boat, and four parachutes with this G.I. Joe set. Those items were split up into green and blue groups to represent G.I. Joe’s strike force (green) and the Cobra Command enemy army (blue). The 4-1/2 x 3-1/2 foot G.I. Joe “Battleground Play Mat” was similar to the TYCOSCENE layout boards introduced in 1982. The mats provided with the G.I. Joe set and other 1980s sets of similar oval track layout design (Rambo, and Transformers) featured color printed imagery on the flat surface. The Rambo set, cataloged only in 1986 by TYCO, was a near clone of the G.I. Joe set contents.